It's not you ... It's me: Mick Jagger & Francoise Hardy Are Two Stylish Peas In A Pod! 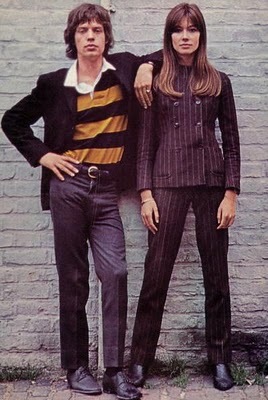 Mick Jagger & Francoise Hardy Are Two Stylish Peas In A Pod! Mick Jagger & Francoise Hardy, who was France's biggest vocalists during the 60s were photographed together in 1967. Both opted for darker-toned-colored clothes. Mick added a peek of color and informality to his outfit by parring his sports jacket with a Rugby shirt with yellow and navy blue stripes. Meanwhile Francoise wore a very Mod inspired double-breasted white pin-striped pant suit.